Koch won the die roll and chose to go first. He activated Instant Fusion to Special Summon Invoked Raidjin and then Set The Phantom Knights of Shade Brigandine and flipped it up to Special Summon it. He then used his 2 monsters to Link Summon Isolde, Two Tales of the Noble Knights and used Isolde’s effect to add Blue Mountain Butterspy from his Deck to his hand. 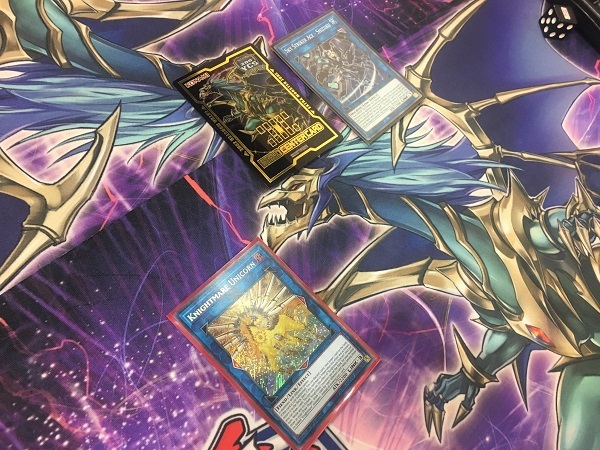 He then used Isolde’s effect and sent Divine Sword – Phoenix Blade from his Deck to his Graveyard to Special Summon Gouki Octostretch from his Deck. 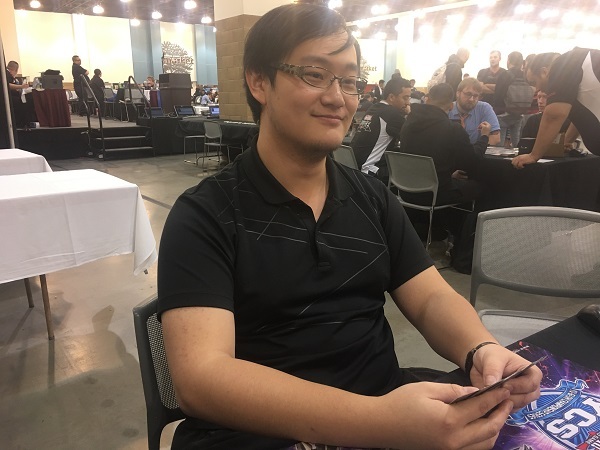 He used Octostretch as a Link Material to Summon Linkuriboh and then used Octostretch’s effect to add Gouki Suprex from his Deck to his hand. He Set a card to his back row and then ended his turn. Xu opened up with Ghost Ogre & Snow Rabbit, Twin Twisters, Terraforming, Shared Rider, and Sky Striker Mecha – Widow Anchor. He drew Sky Striker Mecha – Eagle Booster for his turn and then activated Terraforming. He added Sky Striker Airspace – Area Zero from his Deck to his hand and then activated it. He activated Twin Twisters and discarded Eagle Booster to destroy his own Area Zero and Xu’s face-down Called by the Grave. He used Area Zero’s effect to Special Summon Sky Striker Ace – Raye from his Deck and then sent Raye to the Graveyard to Link Summon Sky Striker Ace – Hayate. He attacked Isolde with Hayate, destroying his own Hayate in the battle and using Hayate’s effect to send Sky Striker Mobilize – Engage! from his Deck to his Graveyard. He Special Summoned Raye from his Graveyard with its effect and then attacked Linkuriboh with Raye. Koch Tributed Linkuriboh to make Raye’s ATK 0 and Xu Tributed Raye to Special Summon Sky Striker Ace – Kagari. He used Kagari’s effect to return Engage to his hand and then attacked Isolde to destroy it. In Main Phase 2, he used Engage to add Sky Striker Mecha – Shark Cannon from his Deck to his hand and draw a Ghost Reaper & Winter Cherries. Then, he used Kagari to Link Summoned Shizuku. He Set Widow Anchor, Shark Cannon, and Shared Ride before entering his End Phase and using Shizuku’s effect to add Sky Striker Mecha Modules – Multirole to his hand. Koch drew to 5 cards in his hand and then Normal Summoned Gouki Suprex. He used the effect of the Butterspy in his hand to Special Summon it and then Xu discarded Ghost Reaper & Winter Cherries. He revealed Isolde from his Extra Deck to try to banish Isolde from Koch’s Extra Deck, but Koch revealed his Extra Deck with no more copies of Isolde in it! Koch Link Summoned Knightmare Phoenix next and discarded Danger! Nessie! to use its effect. He targeted Shark Cannon for destruction, and Xu Chained the Shark Cannon to banish Octostretch and Chained Shared Ride. Koch added Twistcobra and Danger!? Jackalope? to his hand, and Xu drew 2 cards off of Shared Ride. Koch Set a card to his back row and then used his Jackalope’s effect; but Xu randomly discarded the Jackalope from his hand, and Koch used its effect to Special Summon Nessie. Next, Koch combined Nessie with Phoenix to Link Summon Knightmare Unicorn and activated the Unicorn’s effect by discarding Instant Fusion. Xu Chained Sky Striker Mecha – Widow Anchor to negate its effect and take control of the Knightmare Unicorn, prompting Koch to concede. Shunping Xu wins the first Duel with his Sky Striker Deck! Koch started off Duel 2 by activating Magical Mid-Breaker Field. He Normal Summoned Dark Grepher next and activated its effect by discarding Destiny HERO – Malicious. He sent The Phantom Knights of Ancient Cloak from his Deck to his Graveyard and then banished Malicious from his Graveyard to Special Summon another copy from his Deck. Xu then tried to use the effect of Ghost Reaper & Winter Cherries, but Koch banished it with Called by the Grave and negated its effect! Xu Link Summoned Isolde and then used its effect. He sent Divine Sword – Phoenix Blade, Overdone Burial, and D.D.R. – Different Dimension Reincarnation to the Graveyard to try to Special Summon a monster from his Deck; but Xu used the effect of the Gamma in his hand to Special Summon it along with a Driver from his hand to negate the effect of Isolde. The Mid-Breaker Field protected Isolde from destruction. Koch banished a Malicious from his Graveyard to Special Summon another one from his Deck and then Link Summoned Summon Sorceress. He banished Ancient Cloak from his Graveyard to add Shade Brigandine to his hand next, and then Set it and flipped it. He Special Summoned it Linked to Summon Sorceress and then used his Sorceress’s effect to Special Summon The Phantom Knights of Silent Boots from his Deck. He banished Malicious and Isolde from his Graveyard to return a Phoenix Blade from his Graveyard to his hand and then combined Summon Sorceress with Silent Boots to Link Summon Topologic Gumblar Dragon. He then banished Silent Boots from his Graveyard to add another Shade Brigandine from his Deck to his hand and he Set it face-down. In the End Phase, Driver and Gamma were banished. Xu started his turn with Sky Striker Ace – Raye, and Sky Striker Mobilize – Engage! in his hand and then drew Infinite Impermanence. In the Draw Phase, Koch activated Shade Brigandine and Special Summoned it Linked to Gumblar. He used Gumblar’s effect, but Xu Chained Infinite Impermanence from his hand to negate Gumblar’s effect. Xu Summoned Raye, attacked a Shade Brigandine to destroy it, and then used Raye’s effect to Tribute it and Summon Hayate. He used Hayate to attack and destroy another Shade Brigandine and sent Area Zero from his Deck to his Graveyard with Hayate’s effect. In Main Phase 2, he used Engage to add Sky Striker Mecha Modules – Multirole to his hand and activated it. He then Link Summoned Kagari and used Kagari to return Engage to his hand. He activated Engage to add Sky Striker Maneuver – Afterburners! to his hand and used Afterburners to destroy Gumblar. He then Link Summoned Sky Striker Ace – Shizuku by using Kagari and entered his End Phase. He added Shark Cannon to his hand in the End Phase with Shizuku’s effect, used Shark Cannon to banish Dark Grepher from Koch’s Graveyard, and then Set Sky Striker Mobilize – Engage!, Shark Cannon, and Area Zero from his Graveyard in the End Phase with Multirole. 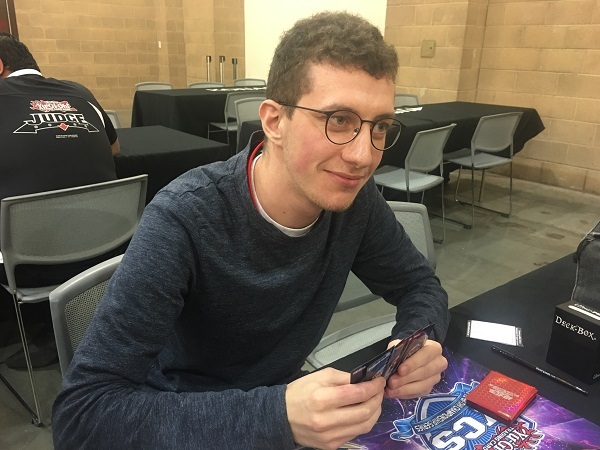 Koch drew a card and conceded, realizing he would be unable to mount a comeback. 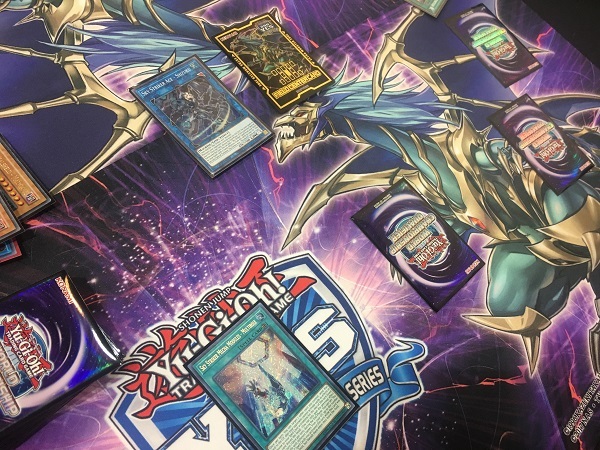 Shunping Xu is moving on to the finals with his Sky Striker Deck!